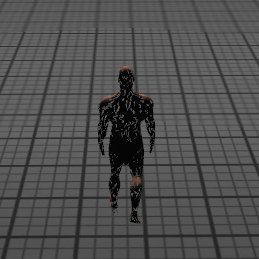 this happens sometimes in the middle of the animation and only for 1 frame, it's a random behaviour, and I can't figur what is causing it. Could it be any kind of synchronization issue between the animation calculation and the rearragement of the vertices? Compatibility isuses? I can't find out what it could be. Are these grey areas holes? Strange...are you doing the animation calls in a thread different from the rendering thread. Yeah they are, I thought they could be artifacts but they are just spaces between each other vertices. And no, everything is being processed in the same thread. Have you or anyone here ever experienced it before? If not, can you give me any kind of idea, based on your experience where to look at or debug this? Mainly because the animation is a black box, and I can't look at it. 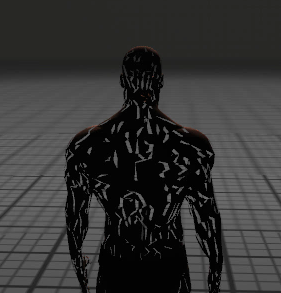 Any chance they're texture transparencies and the problem is a UV problem (perhaps caused by your animation)? Nope, not using any kind of transparency whatsoever. Just a plain, compiled, one-layered textured model. And it only happens once in a while, and not throughout all the animation. Ok, so it seems that this occurs only on compiled mode, so I managed to use the compile options to set a bigger value for "bathSize", for around 10.000, and it did the trick, but, now I have another problem. It seems that low values lead to that, how should I know which graphics cards can withstand such value? is that correlated to the animation object itself by any way? and BTW, what does .compile(true) do? Does it hava a predefined BatchSize value or uses the Config one? I'm not sure what that is that I'm seeing there. Batch size should have to impact on this unless it's a driver thing. On which machine/OS/GPU are you running this on? Have you tried a different one? I've only tried to tweak this values because I read your comment on the compile which said that low values of Batch size could lead to missing poligons, which was kinda the case. I will try on a different one just to be sure, but this change did the trick.